The massive increase of removals of wild horses from federal and public land that is going on right now is based on a proposed fact that the wild horse population is growing fast and uncontrolled. 8000 horses are removed every year on average. BLM states on their official website that the maximum Appropriate Management Level (AML) is “approximately 26 677” and the current (2013) inventory count is 33 780 wild horses, including all 199 Herd Management Areas (HMA) in 10 western states. They also state that the annual average growth rate of the wild horse population is 20% and that the population will double every four year cycle. I am not a wild horse expert, nor a mathematician or even an American, but it is fairly easy to realize that it is virtually impossible to keep a precise count on the number of horses at any point in time or to set a well-reasoned AML and to countercheck the correctness of the figures in question. In other words; this issue is easily exposed to arbitrariness and possible corruption. The Wild and Free-Roaming Horses and Burros Act of 1971 is a public law intended to protect wild horses on public land from persecution and extinction. Bureau of Land Management (BLM) is responsible for the management of federal land and is to protect wild horses and set appropriate management levels (AML), maintain current inventory counts and remove excess horses to prevent overpopulation and rangeland damage. They are to “maintain a thriving natural ecological balance among wild horse populations, wildlife, livestock and vegetation”. Remember these are bi-sentences; the main purpose of the law is to protect wild horses, so if the law is bent to justify as large removals as possible it would be breaking the purpose of the law. If the mission is to protect wild horses, as few horses as possible should be removed from the HMA. Big scale roundups, handling and transportation of wild horses are always traumatic, causing extreme suffering, injuries and deaths by accident. Removing horses for adoption can be a good thing for some horses, but the excess horses are subject to indefinate time in holding facilities, euthanization or slaughter, financed by the tax payers. Therefore it would be misconduct to deliberately overestimate the number of necessary removals. If one were to evaluate “the fact that herds grow at an average rate of 20 percent” as written by BLM, regarding the annual growth rate of the wild horse population, and one were to find the figure vastly overestimated, it would be troublesome. Horses are not that different from humans regarding reproduction. How can wild horses, exposed to harsh living conditions, double their population in four years while the prosperous humankind needs fifty years to do the same trick? I will show you a way to find this out by doing some basic arithmetics. Remember this is only a model of reality so we need to make simplifications. Let us make a few assumptions based on simple, but logical and well accepted facts. There are equal numbers of colts and fillies born and consequently equal numbers of mares and stallions. Let’s assume that a mare gives birth to her first offspring at age 4. Now we need some parameters that determine growth. Let N be the number of horses in the original population while λ is the growth rate. We can now work out a formula that calculates the growth rate, which is how much a population grows over time. First we calculate the number of adults in the original population and assume an even age distribution. Then how many adults we have after one year, namely the number of horses older than four, minus deceased, plus foals that become adult. We do the same for the foals, the number of horses younger than four, plus newborns that survive, minus foals that become adult. Now we can write the formula for growth rate in a population of wild horses. Now it’s time to put in some numbers. The present number of free roaming wild horses (N) according to BLM is 33 780. From a science paper by Feist and McCullough (1975) we get the mean foaling rate(β) 42% and the foal survival rate (δ) 89%. The average life span (µ) in a free roaming wild horse population is a measurement of how healthy or risky life is in a population, i.e. a few horses live beyond 30 years and some die young due to injury, predators or disease. An often accepted figure is 18 years. If we use these figures to calculate the growth rate we get 0.102 or 10.2%. Now, the figures we put in affect the formerly assumed age distribution over time, which affects the growth rate. 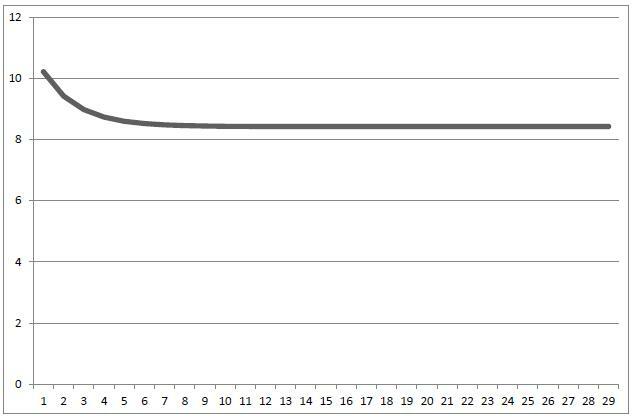 So we need to run a simulation by calculating the growth of the population over time until the growth rate stabilizes, which yields this graph. The result is that the growth rate stabilizes around 8.42%, which is considerably lower than 10.2%. (Compare this to the Pryor Mountain report by Feist and McCullough 2010). As always with statistics and calculations; what comes out is never better than what you put in and when several factors are multiplied the fault is growing fast. What’s good about this exercise however is that the factors are few and there is a clear limitation to what is within reason. If we try to stretch it, how high and how low can the growth rate be if we set parameters in the extreme? Let’s set the foaling rate between 30% and 90%. The foal survival rate could be set in the interval 85% to 98%. Average life span may be as low as 15 and as high as 18. Now we run the calculations again to see what comes out. The upper extreme growth rate stabilizes at 19.3% and the lower example at 4.2%. Giving the number of excess horses in the interval 6 520 and 1 418. If those horses are not annually removed the population will double in 4 respectively 17 years. An average growth rate according to BLM must mean that every fertile mare gives birth to one offspring every year and that the first year survival rate of those offspring is 98%, on average – an unattainable dream to any top breeder! How is that possible? The simple answer is that it is not! Well under special circumstances in certain limited populations with skewed age and gender distributions under a short period of time maybe it is, but not as an average on a vast continent. Is there any explanation at all? I can think of one; free roaming wild horses are not profitable. The political establishment responsible for employment of decision makers in wild horse management is of course influenced by strong interest groups that prefer other land uses. So it would not be surprising if there was a predominance for decisions serving to make sure that as many wild horses as possible are removed, but of course this would be breaking the purpose of the Wild Free-Roaming Horse and Burro Act. This gives a hint about what wild horses are up against and that they need the protection they are legally entitled to, or what do you think? The native origin of the Nokota® Horses; Theodore Roosevelt National Park, managed by National Park Service, have for some obscure reason an excemption from he Wild and Free-Roaming Horses and Burros Act, so it does not apply there, which also means they have no obligation to control who is buying the removed horses and for what use. The wild horses in TRNP are subject to arbitrary park regulations.